The image and text are from today's Image of the Day of the European Space Agency website. "The Balearic Islands are captured in this Envisat image. 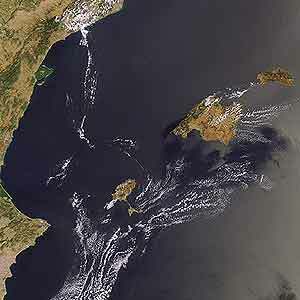 The Spanish islands of Majorca (the largest), Minorca (far right), Ibiza (top left island) and Formentera (beneath Ibiza). Last month, Spain's eastern seashores were inundated with jellyfish, forcing tourists to stay out of the waters. According to Reuters News Agency, the Red Cross has treated more than 10,000 jellyfish stings so far this summer in the eastern region of Catalonia - with a third of those occurring during July. Although scientists do not know the ultimate cause for the plague of jellyfish, it is believed high sea temperatures played a major role. 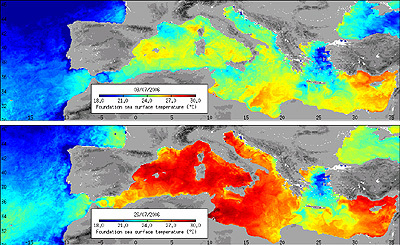 ESA's Medspiration project, which detects the sea surface temperatures (SST) for all 2 965 500 square kilometres of the Mediterranean, witnessed an increase in the SST in the area from 22 to 30ºC between 8 to 26 July 2006." (From ESA). 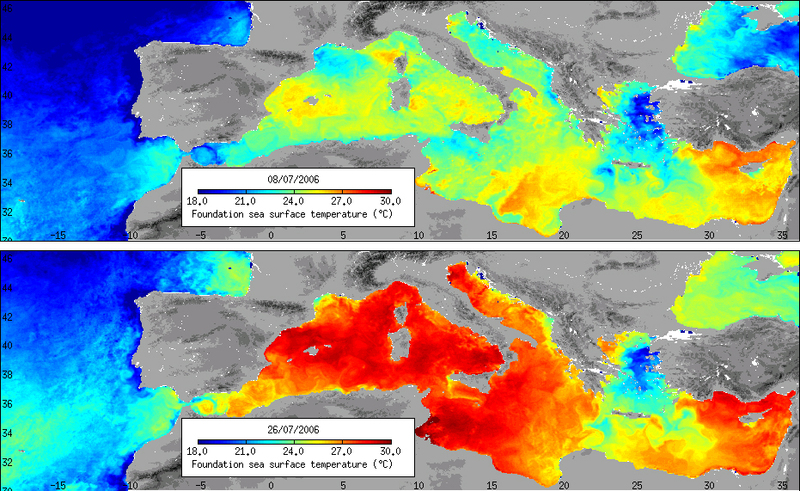 25/05/06 Las medusas aparecen antes de tiempo en el Mediterráneo por el calentamiento y la sobrepesca (El Mundo) El cambio climático, la sobrepesca, la contaminación y la reducción del agua continental que llega al mar son algunos de los factores que podrían haber adelantado la llegada de medusas de centenares de especies distintas a las costas españolas, donde ya se cuentan por centenares. "Spain has nearly 8 000 km of coastline (including Canary Islands and Balearic Islands). Half of it lies along the Atlantic and the rest borders the Mediterranean. Compared to its neighbours further north, Spain is less affected by winter storms from the Atlantic. However, higher storm activity under climate change over the adjacent Atlantic is likely to lead to an increase in the intensity of winds over some parts of the country by the end of the century. Maximum wind speeds could increase by 2-4% in north western Spain by the end of the century, while in Galicia, the number of days with high winds could increase by up to 10%. Another type of storm made its first appearance on the Iberian Peninsula in 2005: Europe’s first hurricane – Hurricane Vince – landed on the south western coast of Spain in October. It was the farthest northeast a tropical storm had ever developed in the Atlantic and it developed over water that was thought to be too cold to be able to support a tropical storm. Following Hurricane Vince, the tropical storm Delta hit the Canary and Madeira Islands in November 2005, leaving behind severe damage, power outages and fatalities. However, so far scientists cannot say whether there is a relationship between such unusual storms and climate change. June 2005.An immense 800-page report has just been published on the effects of climate change in Spain . The study looks at two possible scenarios for increases in CO2 by 2100: one of 120% (850 ppm) more than current figures, and one of a doubling (760 ppm). Global climate models are used to predict climate changes based on these figures. The results are hypothetical and serious doubts exist. The forecasted effects are based on two of the more pessimistic scenarios, predicting temperature rises over the next 100 years of 6-7 ºC. Whether it is wise for the Spanish Ministry of the Environment to base its predictions on such a pessimistic (though possible) scenario remains to be seen. It may well give ammunition to the denialist camp. However, although several climate models paint a less alarmist picture, the minimum increase is thought to be around 3-4ºC (scroll down to August news). For a transition zone like Spain this is still huge amount. Rainfall is also predicted to fall. If true, this will have a huge effect on ecosystems, flora, fauna, agriculture fishing and tourism. The Spanish landscape would change. First figures are for 'pessimistic' scenario. Figures in brackets are for 'optimistic' scenario. Temperatures in Spain are forecast to rise steadily by 0.4Cº a decade in winter, and by 0.7Cº in summer. (0.4ºC/0.6ºC). By 2100 temperatures in the hinterland of the Peninsula would be 5ºC-7ºC higher in summer and 3ºC-4ºC in winter (1ºC less for 760pm scenario). Temperatures on the coast would rise by some 2ºC less than the hinterland. The number of days with extreme high temperatures would rise. Rainfall prediction is less reliable. There are notable differences in predictions for rainfall in world models. However, all indicate a significant fall in total yearly precipitation (rainfall plus the rest). This will be noticed most in spring in all areas. It would seem no more En Abril, agues mil . Rainfall would increase in the already wet northeast in winter and fall in the already dry southwest. In summer rains are down everywhere, except the Canaries. As with winter, in autumn there's a rise for the northeast and a fall for the southwest. Water resources would fall by 22%. Remember these estimated effects are based on the above scenarios. Such marked changed would clearly have a huge effect on ecosytems in Spain . The Peninsula is wedged between two continents with very different climes. Much of Spain is a transition area making it extremely sensitive to change (Atlantic- Damp Mediterranean - Semi-Arid Mediterranean-Semi-Desert). The Atlantic northeast area is defined by temperature. The Mediterranean (most of Iberia ) is defined by its characteristic summer drought. Productivity may well rise in the former, and fall in the latter (as a result, in the Mediterranean , the capacity for carbon capitation would fall). Such changes would upset for some time the ecological balance and favour invasive and pest species. Many species would be forced to migrate either in latitude or in height. Most vulnerable would be mountain and island communities. Many of Spain 's ice-age relict mountain floras and faunas be doomed. They would be forced higher and higher until they had nowhere to go. In such a short space of time it is unlikely that most would be able to adapt. See climate change effect on Sierra Nevada Flora. Some conclusions on Spain of the secretary general for climate change at this week's conference in Buenos Aires. More on climate change in Spain from El País today. As mentioned in ' Iberia most affected by climate change' (see below), the latest models suggest that Spain will indeed be the most affected by climate change in Europe , with higher temperatures and lower rainfall. For Manuel Castro from the Universidad de Castilla-La Mancha it is not a question of frightening people but rather being better informed so as to be able to mitigate the effects of global warming. By the end of the next century, summer temperatures could rise by as much as 6ºC. For the first time models are being built which are capable of predicting at the regional scale. The latest models claim an accuracy of within 50 kilometres. This research is encompassed within Prudence EU an informal grouping of 21 research groups from nine countries. According to a new report by the EEA (European Environment Agency), Spain and Portugal will be most affected within the EU by coming climate change. Storms, floods and droughts are likely to become more and more frequent with a significant rise in temperature expected. The report notes that temperature in Europe has increased 0.95 degrees over the last 100 years. This increase has been greatest in the Iberian Peninsula and Western Russia. 'Cold' winters, which since 1960 have only occurred 1 in every 10 years are likely to become rarer, and will almost entirely disappear by 2080. In contrast, under high emission scenarios every second summer in Europe will be as hot or even hotter than 2003 by the end of the twenty-first century. In southern Europe, these changes are projected to occur even earlier (in Spain by the 2020s). The report claims that the extent and rate of change is 'very probably' beyond all natural variation in the last thousand years or more. The 1990's was the warmest decade, with 1998, 2002 and 2003 being the warmest years since 'reliable' global records began (about 120 years). The report puts the expected rise in temperature in Europe at between 2 and 6.3 degrees by 2100. These figures are in line with world predictions by the Intergovernmental Panel on Climate Change of a 1.4 to 5.8C rise by 2100 over 1990. Some positive effects are noted, however. Northern European agriculture is certainly set to gain. The annual growing season for plants, including agricultural crops, lengthened by an average of 10 days between 1962 and 1995 and is projected to continue getting longer. "Climate change is expected to boost yields for most crops in most parts of Europe over the coming decades. The magnitude of this effect is still uncertain and depends on the climate scenario and how agriculture adapts to climate change. Estimations show yield increases of 9 % to 35 % for wheat by 2050. The largest increases in yield could occur in southern Europe, particularly northern Spain, southern France, Italy and Greece. Relatively large yield increases (3-4 t/ha) may also occur in Scandinavia. In the rest of Europe, yields could be 1-3 t/ha greater than at present. There are small areas where yields are projected to decrease by as much as 3 t/ha, such as southern Spain". However, these potential gains could be more than cancelled out in southern Spain by drastic fall in rainfall. The Pyrenees are likely to experience milder winters with more precipitation, and hotter, drier summers. These conditions are likely to reduce snow cover on the mountains since, in most temperate mountain regions, the snow temperature is close to the melting point and therefore very sensitive to changes in temperature. Glaciers in eight of the nine European glacial regions are retreating. Pyrenean glacial retreat has been most notable. The Pyrenees will face difficulties through lower winter sport enthusiasts in the future. The survival rate of bird species wintering in Europe has improved over the past few decades and is likely to increase further as winter temperatures continue rising. Much will depend on our ability to respond such changes. CO2 concentrations are now at their highest level for at least 420,000 years and possibly 20 million years and are now 34% higher than before the Industrial Revolution. The report concludes by saying that Europeans must learn how to live with a changing climate as well as seeking to limit its effects by cutting emissions. "In general, much is known about the climate system and the changes in global mean temperature over the past 100 years, whereas less is known about the magnitude of other climate related changes (e.g. the frequency and intensity of extreme events) and the impacts of climate change. Despite these uncertainties, almost all indicators in this report show a clear trend, indicating that the impacts of climate change are already apparent in Europe ". Report available here as 6mega pdf file .